Last night I was trimming the back of a dulcimer to meet the sides. After chopping off the bulk of the overhang with a chisel I switch to spokeshaves. Even though dulcimers do not have spokes one can still shave them with a spokeshave. Do not use shaving cream! For most of the work I use a flat-bottomed spokeshave but for the curve in the waist and the recurve near the tail I use a round-bottom spokeshave. From there I switch to a scraper to bring the back flush with the sides. 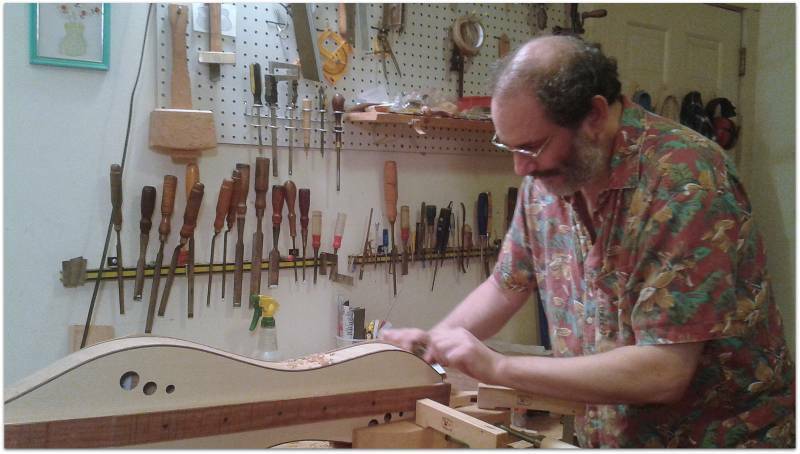 One of the things I enjoy about trimming the back to the sides with a spokeshave is that I get to listen to the resonance of the dulcimer; the friction of the spokeshave against the overhanging back is a bit like bowing a violin. Trimming the back to meet the sides would be faster if I used an electric router but I don’t enjoy doing it that way. Routers are loud, messy, gnarly little beasts! My wife Cynthia came home last night and thought she saw a good photo-op. 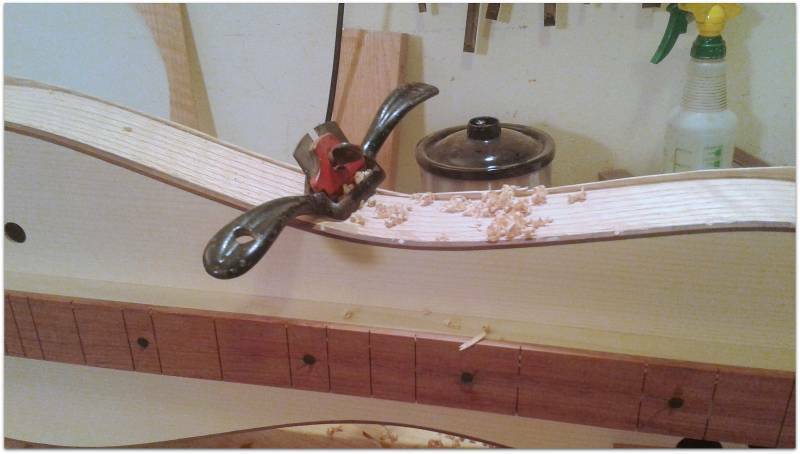 I use a cabinetmaker’s clamp clamped on its side to hold the dulcimer while working on the sides. And yes, fashion is my life. Working with wood is almost at times as fun as playing the dulcimer.